If you're looking for stocks to hold in your retirement account, here are three dividend payers with long-term appeal. Tax-advantaged accounts like IRAs are a great way to save money for retirement. Right now there's an opportunity to stash three great dividend-paying stocks in your individual retirement accounts while investors are taking a short-term view of their futures. If you have money to invest in your IRA, take a close look at ExxonMobil Corporation (NYSE:XOM), Procter & Gamble (NYSE:PG), and Hormel Foods Corporation (NYSE:HRL). Exxon is one of the largest oil and natural gas companies in the world. Its business is heavily influenced by its upstream operations, which do the actual drilling, but it is also diversified across the downstream chemicals and refining industries, as well. This gives it a fair amount of balance, since low oil prices (bad for the upstream operation) are a net benefit to its downstream operations. Financial results from 2015 provide a good example of this, as upstream earnings fell roughly 75% year over year while downstream earnings more than doubled, helping to offset the pain of the deep oil downturn that started in mid-2014. Right now the oil giant is working through a weak spot, with production falling in recent years and return on capital employed drifting into the middle of the oil-major pack after years of leading it. Exxon's stock is lagging most of its peers in a big way this year, but that's pushed its yield up to around 4%, the high end of its historical range, and its price-to-tangible-book-value ratio to lows not seen since the late 1980s. Better yet, Exxon is working to fix the problems that have investors so worried. For example, it has major projects in the works in offshore oil, natural gas, and onshore in the U.S. And it intends to take a more active role in managing its largest projects, which it believes will help to push return on capital employed from the single digits into the midteens. With 36 consecutive years of dividend increases under its belt, Exxon has proven that it can deliver over the long term in a highly cyclical industry. It's just that changing course for such a large company takes time. Now is a good time to stash this relatively cheap stock in your IRA for income and recovery potential while Wall Street is focused on near-term results. Procter & Gamble is a giant in the consumer goods space, with iconic products like Bounty, Tide, and Pampers. But don't think of it as a manufacturer -- think of it as a brand manager. It uses its hard-to-replicate global distribution network, expansive research and development skills, and advertising scale to nurture brands and fend off competition. That said, despite having a collection of some of the world's best-known brands, Procter is dealing with a changing market as customers focus on natural products and buying over the internet. This is hampering near-term results and has led investors to push the shares lower by around 20% so far this year. However, Procter & Gamble is working to shift with the times. For example, it recently revamped its brand lineup, jettisoning smaller and less profitable brands so it could focus on its most important assets. It has been introducing more "natural" products under its iconic brand names. And it made the tough choice to drop prices in its shaving business to better compete with upstart internet brands. These are just three notable examples of the efforts being made to adjust to a new market environment. That said, these moves will take time to show results. For example, dropping prices hurts the top line (which will happen this year in shaving), but price cuts help to protect long-term market share. 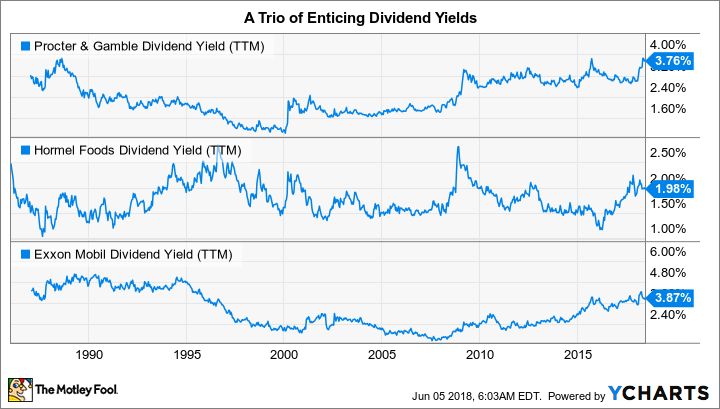 PG Dividend Yield (TTM) data by YCharts. With the stock price down, P&G's yield is up to around 4%, at the high end of its historical range. The company has increased its dividend annually for an almost unbelievable 62 years, however, which means it's seen some ups and downs in its time. It's highly likely it will survive this tough spot and, eventually, regain investor favor. If you are looking for a great company to stash in your IRA, Procter & Gamble should be on your short list today for income and capital appreciation potential. The last company is Hormel Foods, a protein-focused food producer. Although it might be best known for making Spam, its collection of brands hold the No. 1 or 2 spot in 35 categories throughout the grocery store (65% of 2017 sales). It also has a sizable presence in the food service industry (27%) and an expanding international reach (5%). That said, like P&G, Hormel is dealing with shifting consumer buying habits, as they're focusing on fresher and healthier fare. Hormel has been adjusting, selling off brands that weren't resonating with customers (like Diamond salt) and buying ones that were more on target with today's tastes (like Wholly Guacamole). More recently, it has focused on building its presence in the deli space, an area of the grocery store that's growing four times faster than the average for the entire store. With an incredible 52 years of annual dividend increases behind it, Hormel has clearly worked through difficult periods before and continued to reward investors for sticking around. That suggests that now is a good time to take a look, with the stock still off around 20% from its late 2016 highs despite a price recovery that started in late 2017. Its roughly 2% yield probably won't excite you, but it is toward the high end of the company's historical yield range. I wouldn't say Hormel is dirt cheap, but it's better to pay a fair price for a great company than miss the the opportunity to own Hormel. ExxonMobil, Procter & Gamble, and Hormel are all well-known stocks that are out of favor today. However, they've all proven their ability to survive and thrive through good markets and bad. If you have an IRA, the relatively low prices of these stocks today is an opportunity to put a trio of solid growth and income stocks into your retirement account. If you take the time for a deep dive, I'm certain one or more could find its way into your IRA.